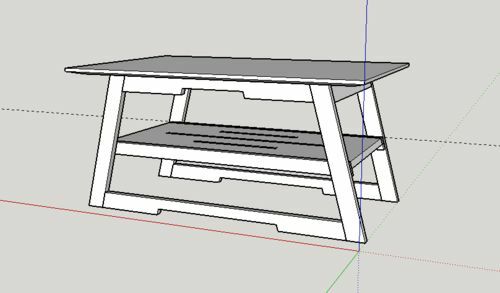 The image below shows a coffee table that I’m making for my daughter. When I first showed the image to her she was good with it but now she decided that she could do without the shelf in the middle. So now, without the shelf, I’m wondering about stability. The long top and bottom rails will be joined to the legs with bridle joints so that will be enough in the long direction but its’s the short direction that I’m thinking about. There will be a short apron at the tops of the short sides but those will be just pocket screwed to the leg sections since she needs this to be able to come apart from time to time. The top will be secured to the top aprons with standard “z” table top fasteners. The overall height is ~17.5”. Does anyone see any issues as is or do you think I will need some sort of rail in the middle of the short ends? Not sure how often she may need to disassemble the table, but I would worry about pocket screws being used in place of knock down hardware. As far as the stability goes I would certainly add something either to the lower ends or perhaps a support across the middle. 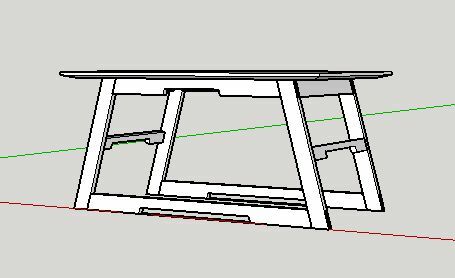 Maybe a wide piece with a cutout to match the relief cut in the upper and lower apron pieces. I see the leg assemblies splaying outward. I’d put a cross member down low, or one at each end. I would add across brace about half way down from the top. That should make the legs more stable. keep the shelf and move the bottom of it down to about 2” off the floor. Ya know, I’m starting to lean more that way…. Just keep it for the strength the legs need and I know she’ll need a place to put more crap. I’m still thinking on it…. I see the leg assemblies splaying outward. I d put a cross member down low, or one at each end. I prefer no shelf also, they seem to just collect clutter.. I agree with others on crossmember, or how about just one in center. 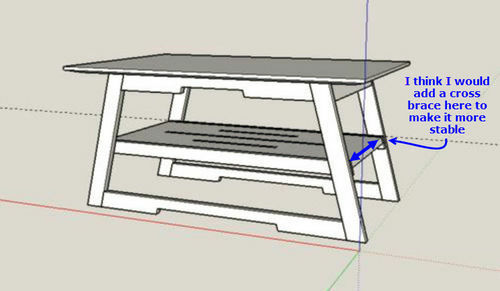 One possibility that would work is to make double sided legs so you get support in both directions at the top. It is not as good as stretchers lower down but it should work and you can always add a shelf later. 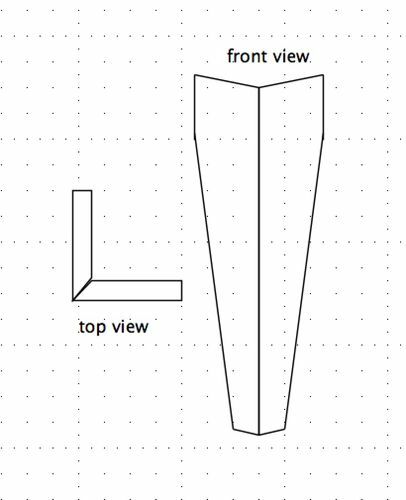 It involves mitering the corner where the two parts meet to give it a clean appearance, tapering the leg pieces to the bottom and making the compound angle cuts at the top and bottom of the legs to get the angles in you illustration. I drew a quick example in the attached image. I gotta go with Woodshaver Tony. Just add an additional “end apron” at the bottom. Yeah, I think that’s what I’ve decided. This is my new plan. GR8HUNTER (also Tony) suggested adding the same profile cutout to them. I’ll secure them with some threaded inserts and connecting bolts. Same with the top aprons instead of pocket screws.